We will begin to look towards the darker meanings of the lenormand cards. These meanings can alert a reader to energetic disturbances and imbalances in and around the client. In the Lenormand deck there are traditionally seven cards which in certain combinations can be interpreted as dealing with the interference or manipulation of energies aka negative magic. We will look at each of these cards in turn to discuss their symbolic and folkloric values before forming the pairs or combinations of warning. When using the standard European Blue Owl deck, card 12 The Owls is added to the list. 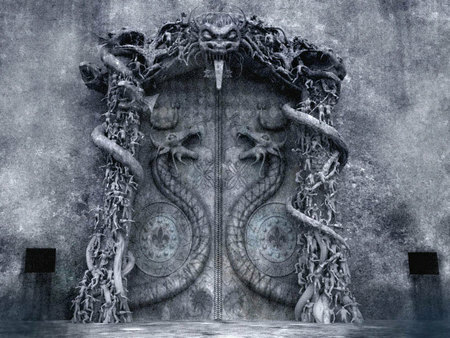 Practitioners will include card 07 The Serpent at the top of the list bringing the number of Dark Art cards to nine. 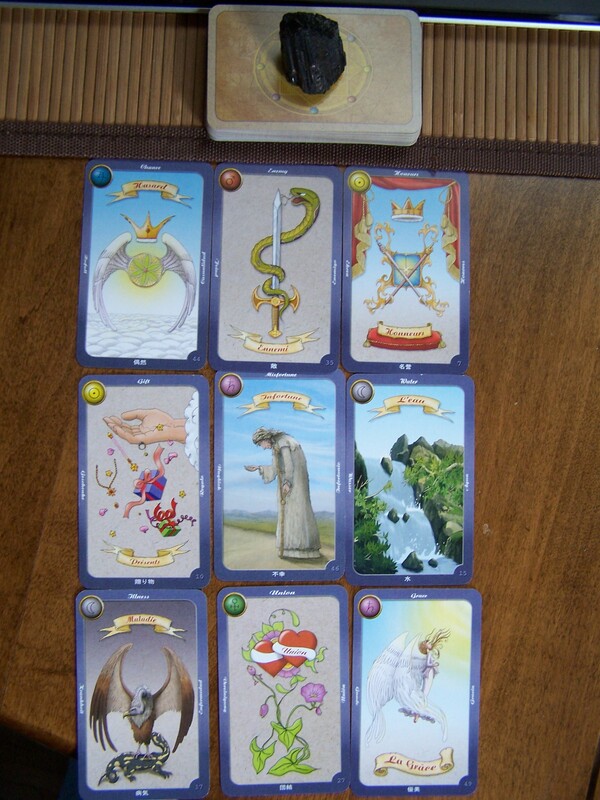 I see a lot of readers their queries and interpretations in short spreads posted to Lenormand forums. What I continue to observe is that most people have not “studied” the cards, having rushed past the introductory phase in their haste to get into the Game. This is recognized by the use of single card meanings or keywords in an interpretation. Lenormand is read by combinations only. The basic meaning of any card is geared towards the making of a pair. As a self-taught German school lenormand reader I started when there were few English written resources and only standard Lenormand decks available by order in the US. 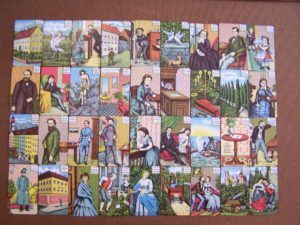 By way of German data bases, websites and online translators in conjunction with the faithful practice of daily draws and journaling, I slowly began to tune into the energy of the Lenormand method. It wasn’t easy and it surely wasn’t fast. I will say things didn’t click for me until around the 3 year mark. When lenormand method is learned as a skill there is no need for “feelings” when examining a line of cards. One reads the symbols, follows the directions of the signs and uses the formula for pairs to get an answer from the cards. This is the root of clear interpretation- never guessing, never rote meanings lifted from a book or assumptions colored by personal experiences or opinions. The disciplined development of learning a deck from the bottom up, from rank to rating to pairs by way of a daily 3 card draw eliminates any need for fill in the gap supposition. When one chooses the number of cards to be spread whether it be a 5, 7, or 9 card line, one is setting an intention. Context, skill and intention eliminate the need for the false support of pulling extra cards, i.e. shadow or clarifying cards. It is best to steer away from complications in the beginning stage such as mirroring and knighting. Bringing in playing card meanings is also a bad idea for a beginner. It is best to use the inserts as “people” indicators and not mix the methods of playing cards divination such as counting the number of red and black suits to evaluate whether the read is positive or negative. Why? The German method rates the 36 cards themselves as positive, negative or neutral/a balanced mix. This is something most Lenormand readers seem to skip altogether in the learning process. The card ratings help the beginner in working out the meanings of paired combinations in a daily 3 card draw. Neutral’s balance takes on the tone of the positive or negative cards in proximity. Two neutral rated cards with a positive are a yes. Two neutrals with a negative rated card is a no. I started with the German school and have stuck with it. I am aware of the Belgian, French and Brazilian variations of lenormand card meanings but do not chose to incorporate those meanings in my general client interpretations. Card sums or the adding of the values of the numbers on the cards is a Tarot tool and is not traditional to lenormand. Mixing systems and inventions result in confusion, while simplicity brings clarity. The Lenormand card 33 The Key is a positive rated card often read as a confirmation or a yes in a small spread. This is much too simple and vague. The meaning of the Key as a topic card involves security and by extension what is accessible or available. 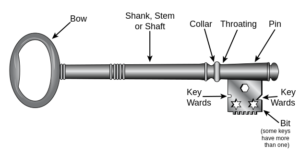 Let us look closely at the horizontal illustration of the parts of a key shown below. The left side or the bow of the Key can say that the card falling on the left or before it is protected or secure, i.e. locked or closed. The card to the right or in front of the business end of the key as shown would be unlocked, open or accessible. In the vertical style of Card 33 one would read the image as the card on the shaft or pin side being closed or protected and the card on the bit side as opened up or accessible. Lenormand cards are directional as one moves forward in interpretation. In a linear read of 5, 7 or 9 cards, The Key can be used based on direction whether vertical or horizontal to shed more light on the cards which it pairs with or touches. The Cross is a negative rated card found in the Lenormand deck as the final card of the series. Lenormand also has a Coffin card which has a neutral rating. 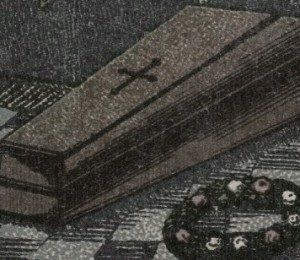 In Kipperkarten, the two concepts related to endings are combined on Card 19, Death which shows a wooden casket with a cross carved on the lid. Many readers have issues with any card which represents a change to the status of a sentient being’s vehicle especially those pointing to the permanent end of a cycle. The Cross represents the cycle of existence. It is also a sign of Time or the Fourth Dimension which is a part of the physical world. Time is invisible. It is the dimension of Spirits or energies. The Cross represents the Time allotted to each of us. It is our life cycle and the duration of various events that occur in it. Birth and Death are essential parts of existence. All events and phenomena are timed. They have a beginning, a middle and an ending. For some readers this three point process is shown by reading the cards on the left and right side of the Lenormand Cross. In Kipperkarten readers use the head and foot of the Coffin. We as the living, deal with our place in Time. We move through Time and it moves through us as well, even when we are perfectly still our planet spins. A reader needs to acquaint themselves with the unseen world of energies and make peace with it. A failure to do so out of fear or a disbelief in the Afterlife limits the development of one’s ability to help those they advise. One must acknowledge the many small deaths and permanent ending which occur over a person’s lifetime. We shed or lay some burdens down and move on to take on new and different challenges. The energetic connections between the people involved with a Querent are openly shown in any Lenormand and Kipper GT. The terminology of a “third party reading” seems to have emerged in late 20th century when Tarotists formed exclusionary guilds to distance themselves from the swelling New Age hordes of fortune tellers claiming psychic powers. 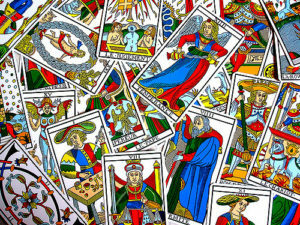 However, in Tarot and playing card readings even smaller spreads will automatically show persons involved with any situation asked about by a Querent. Then it becomes a matter of how the question is asked and the context, the new “sleight of hand” used by the reader to “shift the blame” for any violation of privacy. What privacy? Privacy in the 21st century age of information pirates or hackers is an antiquated construct. The blind spot of the Querent is the reason why they are searching and it is also the mote in their eye which cannot be removed by another person. Truth is participatory when and if the reader has the skills to present it to their Querent. 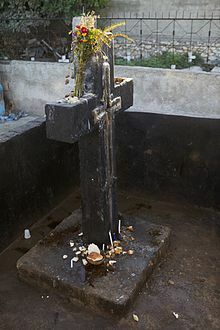 Diviners reveal and Oracles are the mouths used by Spirits. Neither are obliged to respect the limitations inherent in man-made and defined “third party” rules. 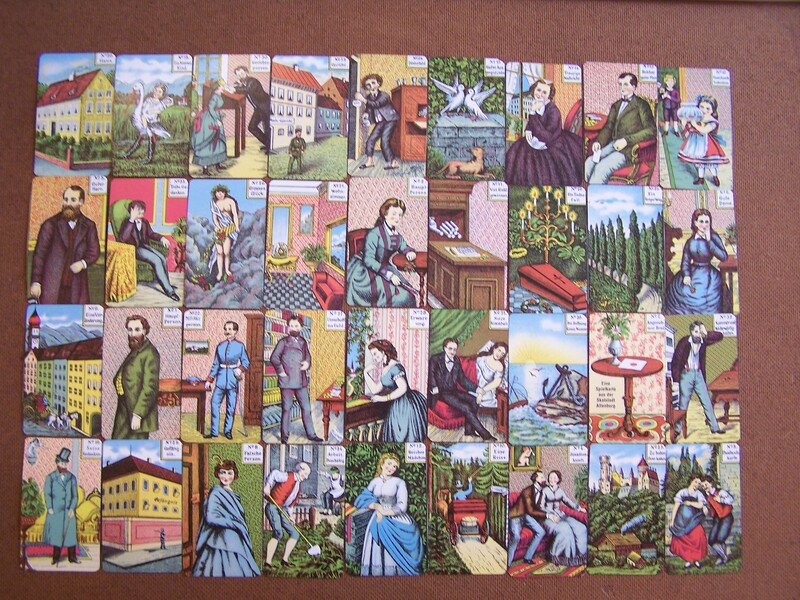 The Full Spread of 36 cards in Lenormand and Kipperkarten is called the Grand Tableau or the Great Spread. The 36 cards are each said to be in houses. This is the terminology used in Cartomancy, however, in my head I imagine the G.T. in the 9 X 4 form as a Great Mansion or a Castle which has four floors each floor having nine rooms. In the Lenormand 8 X 4+4 style I imagine the Castle has four floors with 8 rooms on each floor and a basement beneath the house consisting of four rooms. The Great Mansion is a house of cards and the image of a house made of cards exists in many cultures. Just as a physical house has a Spirit which dwells within it so does a house of cards. The GT has an intelligence which forms the House and which is the guide to its inner layout. This Spirit is not a consequence of the way the cards fall but is the causal factor in their arrangement. The Marseilles Tarot is my oldest friend. We met when I was a girl. The French titles were a delight to my eyes and ears. It was a deck I was to chew on and finally swallow whole. After fifty plus years I rarely shuffle to read with these cards, they simply show up in my interior landscape and converse with me as any old friend would. Is what they tell me secret? No but it is confidential. Just as you wouldn’t go about telling others what your best friend confided I wouldn’t tell what the Marseilles deck says to me for it is personal. What I can do is introduce others to the Spirits of the deck. The rest is up to them! In the language of Science Fiction, accessing the deep unconscious levels of genetic information is portrayed as being put into a state of suspended animation or into a subzero cryosleep coffin. In the Stargate film the image of a sarcophagus was used for the recharging of alien life force. These cold storage techniques are no longer theories but have been made into working models. The idea of suspended animation in interstellar travel comes from classical physics. It is based on immobilization to conserve or transform life force energies needed to transcend the “distance” it takes to travel in space over time. However, distance and time as we know it are not factors in quantum space, thus, the concept of the cold box or coffin is a picture or ideogram for the state of holy communication with the abstract which in quantum physics is known as dark energy. See: TV: Lost in Space, Star Trek Original Series/ Star Seed episode (Khan!) Films: 2001, Stargate, Lifeforce, Event Horizon, et al. 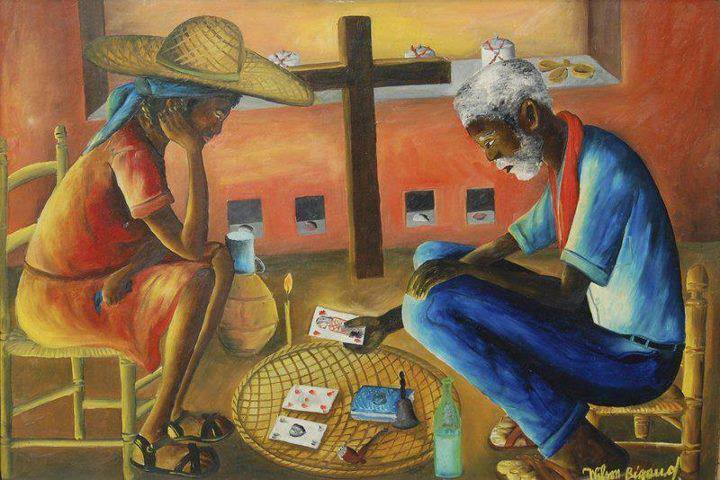 Fortune tellers look at the everyday occurrences surrounding the questions of love, money, health. Fortune telling seeks solutions to help people survive and thrive in the conditions and environment in which they find themselves. Their answers come from the group consciousness. Diviners use their tools to contact levels behind and under those which are in physical phenomena. To divine is to dive into the deep waters of the group subconscious mind or the collective subconscious mind, an older term which I prefer. Divination is a metaphysical process. It seeks to contact occult or unseen energies which are on their way into manifestation; forces which have left manifestation; and forces which were active prior to this existence. Divination makes contact in order for an individual to learn to navigate in, evolve and eventually transcend the limitations of the collective subconscious code. Oracles deal with the unconscious levels which are abstract and energy based. Energy is the principle of existence itself. These principles or laws of existence are the Princes of Power. These are non-physical sentient Entities who move or flow unseen but perpetually present in all the worlds which constitute our multiverse. An oracle communicates with these energetic archetypes which can and do personify themselves as Thoughts, Voices, Visions, Dream Persons, etc. No rituals or tools are needed. An Oracle has a direct internal connection to one or more of these sentient energies. So we see three levels. 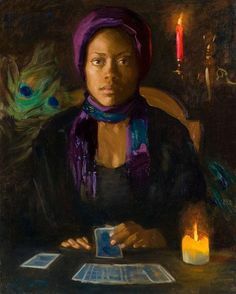 Fortune tellers work in the nexus between the personal mind and the group mind. Diviners use tools to go deeper into the group subconscious and return info to the surface of the mind. Oracles have an internal link to an abstract sentient entity on the group unconscious levels and function as an interface between the abstract and the concrete world, in other words the Oracle is the tool used by Higher Forces to communicate with mankind by re-calibrating frequencies and signals. “The Six” in the title comes from the 1976 movie, The Legacy. The intellectual mind needs to explain phenomena, to see examples and validate current events by comparisons to past patterns. The mind likes a good story. In dealing with cards one works with an abstract energy which uses symbols and images as a notation system. This is the way the subconscious communicates with the intellect. The messages of oracle decks such as Lenormand and Kipper tend to be short and to the point like flashes of lightning in a night sky and the reader’s voice becomes the trumpet of reveille. The sleepy intellect awakened by such sharp notes automatically wants to be soothed by a softer sound. The New Age style reader works to comfort their client’s intellect to spare them the disorientation or break beat inherent in the message or to cover their small amount of skill with a long winded story. Both approaches are wrong. Readers should train in a Cartomantic system before even saying the word “Intuitive” which actually refers to the inner tutor – the interface between the subconscious and unconscious levels. Each oracle deck has a tutelary Spirit set over it. Only when a Reader can interface with the Tutor over the deck do they move beyond the techniques to become “intuitive,” or clear or in that system. One system does not transfer automatically into another system. To be clear even in a system such as Tarot one must know each variation of deck has a different Overseer. New artistic versions of an old deck do not share the original tutorial spirit. Each new art deck is an adaptation on probation and must wait for followers who can master it over generations to collectively create a Tutor. To be a Cartomancer is a journey which requires a commitment and the investment of years of study not a weekend or a week! Modern times force people to seek instant results, to buy a deck, open a book, watch a video and hang out a shingle. Nope. It just doesn’t work like that!